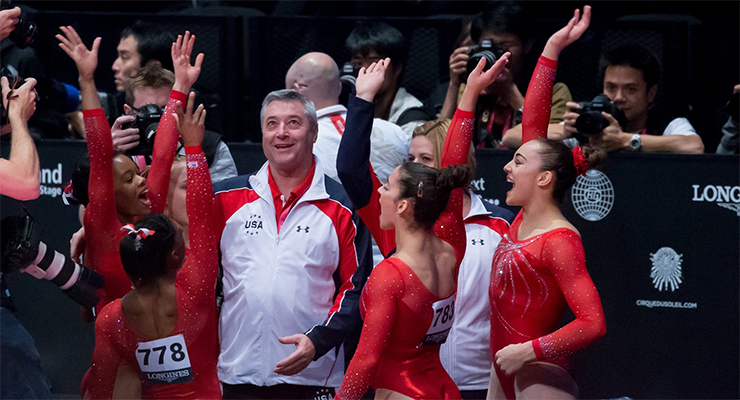 Mihai Brestyan looked elated as he celebrated with the US Gymnastics team who three-peated as World Champions. Photo by Christy Linder. Simone Biles told us what kind of “mental break” the US team got that helped them perform at their best in team finals. The incredible success of the British women’s program, winning the first ever World Team medal : angry beam, vaulting under pressure and emotion filled floor routines. Swaggy Maggie Nichols performing like a G! Why was Rhonda Faehn running to take Skinner and Dowell into the arena for march-in? Komova allegedly blamed Russia’s loss on China and the US using steroids. Russian MVP’s Afassaneyva and Paseka came through when others faltered. How USA Gymnastics reacted and their full response when we asked why MyKayla Skinner and Brenna Dowell weren’t on the floor with the team during team finals. NCAA team coaches for Jamaica’s official response to the Olympic Test Event (AKA only want to qualify for the Olympics) overlapping with NCAA Championships. Balance beam delays in prelims were due to a discrepancy of D scores. If D scores is off by 0.2 judges must conference. In finals zero margin error is allowed. NOOO! Ellie Downie fell again on UB (tkachev), after Ruby hit. Up to Ferlitto to save all of the country of Italy now after Enus fell. Becky Downie hit bars! Full house here and they went NUTS! Getting teary hearing so many people scream for great gymnastics. HEART YOU GLASGOW! Lots of coaching from the sidelines, coaches not on the floor but behind barrier on the floor screaming at their gymnasts. Wang(CHN) has been waiting to go on BB since before Mai (JPN) did her entire floor routine. The whole GB BB squad just did a @RubyHarrold on BB: Like Tequila, so hot they make us want to take our clothes off! Stress fractures don’t casue pain if you are ERIKA FASANA!!! 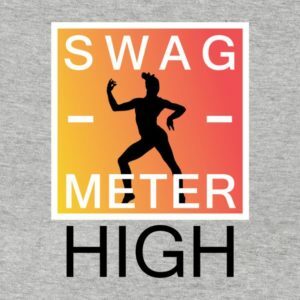 SWAG-O-METER is about to BURST! Bless Little Canada for giving us @MagsGotSwag12 and all her swag. If you didn’t believe that Aly would hit tonight, you’ve been blind for the past 6 years. Beam demon! Only deduction in Simon’s entire BB was a freakin’ hop on her landing. The more pressure, the more of a diamond she becomes. Kharenkova (RUS) fell on the easiest skill in her routine, L turn. GGHHHH! SCREW THIS BEAM! If Khorkina is here, she’s going to cook these girls for dinner. Oh, team Russia…. Two falls for Komova tonight. Bars and now BB. Khorkina is defiantly going to ask them in for cookies like Hansel and Gretel. Shang (CHN) just hit her FX but the crowd was like meh. Even though, Thorsdottir gave away tenths in bonus connections & had three balance checks, still feels like NED invented a new way of doing BB . Sanna Wevers missed her D+D aerial aerial bonus connection. NED is off tonight, being pioneering is hard work (we know). Ellie Downie is in tears after anchoring vault and so are we and basically the entire UK right now. Crowd is LOSING their minds as GB wins first world team medal, Ellie Black (CAN) off BB in unsual falter. 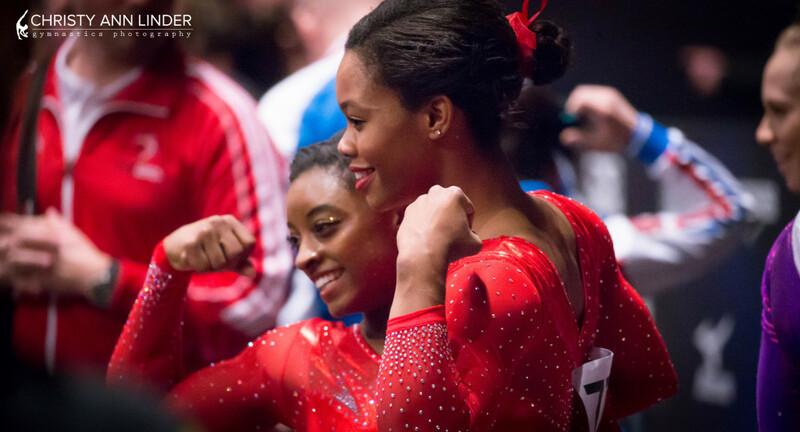 The best way to celebrate your first WAG team world medal is by watching Simone on FX. CONGRATS TEAM GB! 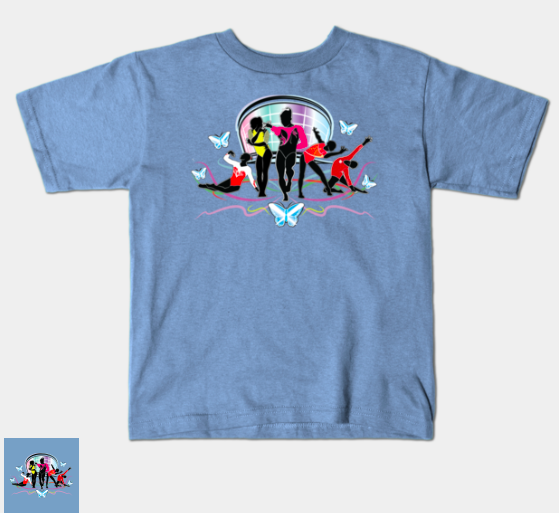 Support your favorite gymnasts and podcast by clicking on the image to see our t-shirts! Competition format: six gymnasts per team, one alternate. Five gymnasts compete on each event in prelims with only four scores counting (5 up 4 count). In finals, only three gymnasts can compete and all three scores count towards the team score (3 up 3 count). Gymnasts you must watch in prelims because although they might not make finals, they will make you believe in the Gym Gods: Thorsdottir, Berki, Wever, Zapata, Millousi and more. Jaw-dropping skills you must watch lest you kick yourself forever: Bretschneider on high bar, Ablyzin on floor, Toni-Ann Williams’ Produnova off beam, Chustovitina’s Produnova on vault, Ruby Harold’s Zuchold, Schafer’s side some half. Medal Favorites and our predictions: Brenna Dowell will win all the things! Danell Pecht and Kerri Joyce are getting two tickets each for floor seats, t-shirts and hospitality at Elevate the Stage! 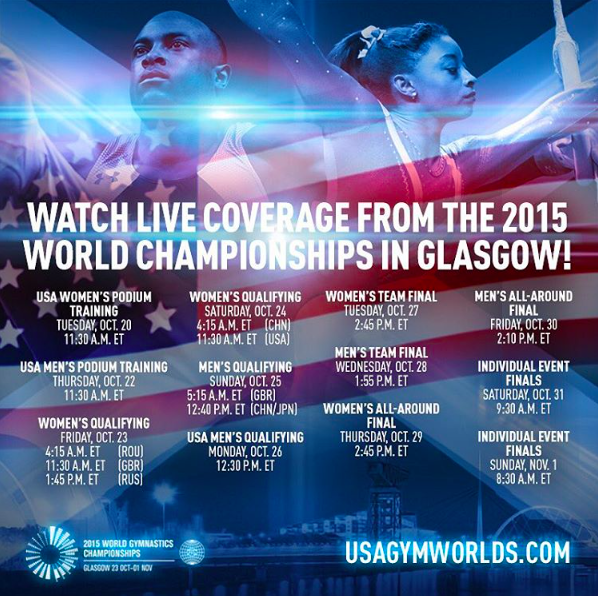 If Simone wins the all-around in Glasgow, does she automatically qualify for Rio? How can Manrique Larduet qualify for the 2016 Olympics in Rio de Janeiro? What about NCAA favorites Danusia Francis and Toni-Ann Williams, who are competing for Jamaica? Unfortunately, you need a Ph.D. in FIGese to interpret the federation’s qualifications rules. To make things simpler for you, we decided to create a flowchart. 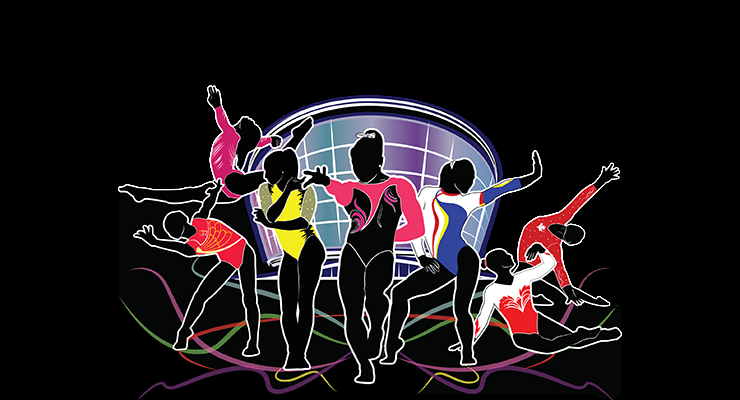 Follow the lines and figure out how your favorite gymnasts will punch their tickets to Rio. If the flowchart is too small on your screen, click here to enlarge it. Sadly, even if Simone wins the all-around in Glasgow, she is not guaranteed a spot at the Rio Olympics. Gymnasts’ all-around placements in Glasgow do not guarantee them spots in the 2016 Olympics. And for gymnasts like Danusia Francis or Manrique Larduet to qualify directly to the 2016 Olympics, they must medal on an apparatus. Fair or not fair? Leave your thoughts in the comments below! P.S. Special thanks to @CordeliaGymFan and @CattyComments for fact checking the flowchart! 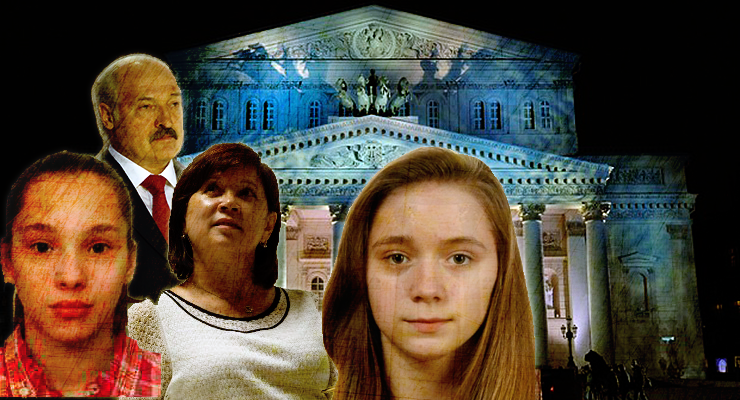 Nellie Kim and Belarus President, Alexander Lukashenko are at the center of a controversy that left Belarusian gymnasts, Sviatlana Lifenka (R) and Valeryia Tsekhmistrenka (L) out of Worlds. What she thought of the winning impression video from our It’s Not About Perfect book giveaway contest. Settles the debate for us: Is high altitude ever an excuse for poor conditioning? Two Americans were granted expedited dual-Belarusian citizenship and state that they will compete for Belarus instead of the native Belarusian team. The American teens’ interview with International Gymnast was off-putting to say the least (read it here). We separate fact from fiction and explain why the Americans aren’t technically switching countries at all or breaking International Gymnastics Federation (FIG) rules. Uncle Tim puts this kind of “make your own team” activity into historical context for gymnastics and other Olympic sports. Our opinions on what the unintended consequences of this precedent could be and where we should go from here. Eythora Thorsdottir debuted a new floor routine that’s causing controversy and our artistic hearts to bleed with joy! Could Ellie Downie be the dark horse for an all-around medal in Glasgow? Why the Netherlands are leading the way: in innovation, the Spirit of The Code, and unique beam construction. Natasha Coates is our gym-hero of the week! SPECIALNESS: It’s on podium and the college coaches will watch the top levels on Saturday night. 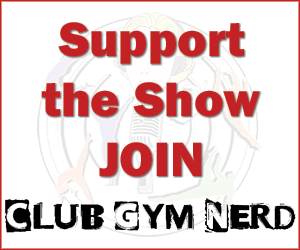 $250 off of a gym’s registration (20 or more gymnasts) to compete in the JO meet and no team fees. 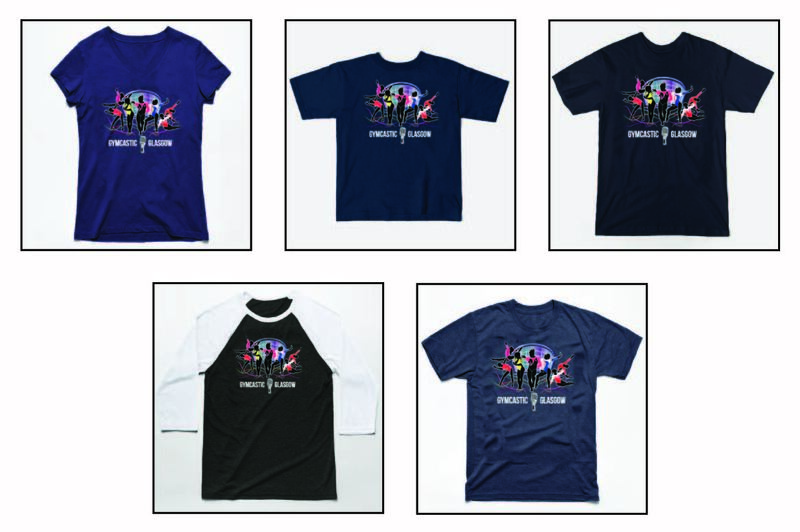 Four VIP passes to watch the college meet on the floor, access to hospitality and four free t-shirts. ***With this, the winner will have to be someone 18 or older because recruitable gymnasts can’t be on the floor during college meet competition (blame the NCAA rules). 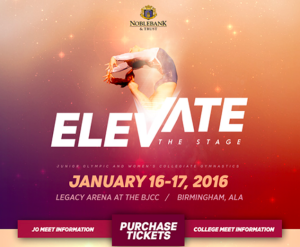 More details on the Elevate the Stage podium meet here. Kwan, Dickson Eager for Worlds Debut on Behalf of Belarus, the International Gymnast interview.